Gorges du Fier is a walking path wrapped around the river carved canyon that adds to the adventure of the city of Annecy. This point in the city offers attractive views because of its elevated positioning and is ideal for photography as well. at the exit point you have a display pertaining to relevant information geological underpinnings of the canyon. Your trip to this adventure spot in Annecy is sure to be a good one if you love exploring hidden facts and experiencing the beauty of new places. Avoid visiting the place on a rainy day. The Gorges du fier can be easily accessed by car. You can take a bus and get off at the nearby village and walk your way to the Fier. Trips to the fier are available as well. You have to pay an entry fee before you start the hike. Love this? Explore the entire list of places to visit in Annecy before you plan your trip. Fancy a good night's sleep after a tiring day? Check out where to stay in Annecy and book an accommodation of your choice. How popular is Gorges Du Fier? People normally club together Librairie Decitre and Le Semnoz while planning their visit to Gorges Du Fier. Amazig natural phenomenon where the water from the region round Lake Annecy flows through to the River Rhone through a narrow crack in the rocks that in extreme conditions reaches up to 27 metres deep. 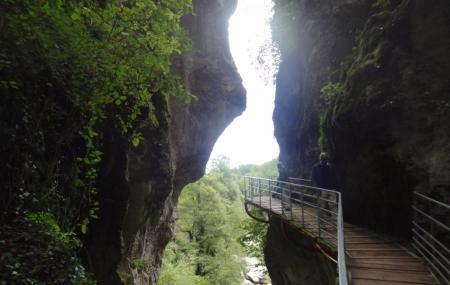 Suspended walkway enables you to walk through the gorge and see the amazing shapes sculpted by the water. Taking a short walk in a full of running water gorge was never that easy and comfortable. Just next to Annecy there is the wonderful Gorges du Fier. A deep gorge curved in the rocks is beautifully set with bridges and balconies. A medieval tale about a knight and a page boy which is written on a sign by the trail, helps to transform the journey in the enchanted gorge into a magical dreamlike fantasy. Great for a three hours trip with the family. Looks amazing. Not a huge amount of time to spend here but good for the entry price really. Gets quite busy on the board walks which are quite tight. Tie this trip in with the Chateau up the road and you'll have a great morning out. We had a nicd walk along the gorge here. Quite a short walk though but the scene was awesome. If you are around here, this place might be worth to visit.